Re-released by popular demand, this powerful guided visualization CD has helped thousands of people reduce stress, boost health, break self-limiting beliefs, and reach their creative potential in work and life. Dr. MICHELLE MILLIS CHAPPEL has a PhD from Princeton in psychology. When she was a professor, students used to line up outside her office to ask for her advice. She always told them to follow their hearts. One afternoon as she watched yet another relieved face disappear out her office door, she realized she wasn’t following her own heart. What did she really want to do when she grew up? Sing in a rock-n-roll band! She’d only written a handful of songs, but she knew if she didn’t take the risk then, she never would. After being voted “Most Inspirational Professor” at the University of California, Santa Cruz, she ditched academics to follow her dream to be a rock-n-roll star. Since then she’s had top 10 and 20 radio singles overseas; a #1 hit on US college radio; 7 songs featured on ABC, HBO, Encore, and Showtime; and won 17 Billboard International Songwriting awards. She was also a finalist for “Best International Artist” in Australia (The MusicOz Awards). For the past 18 years Chappel has used music in her creativity workshops and keynote talks to help thousands of people, ages 8 to 84, find their life calling and reach their true potential. 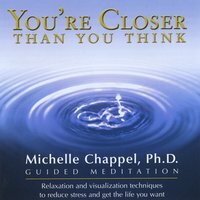 Participants made such powerful breakthroughs as a result of the guided meditations she led in her classes, they soon requested that she record this CD so they could use the visualization techniques at home, too.